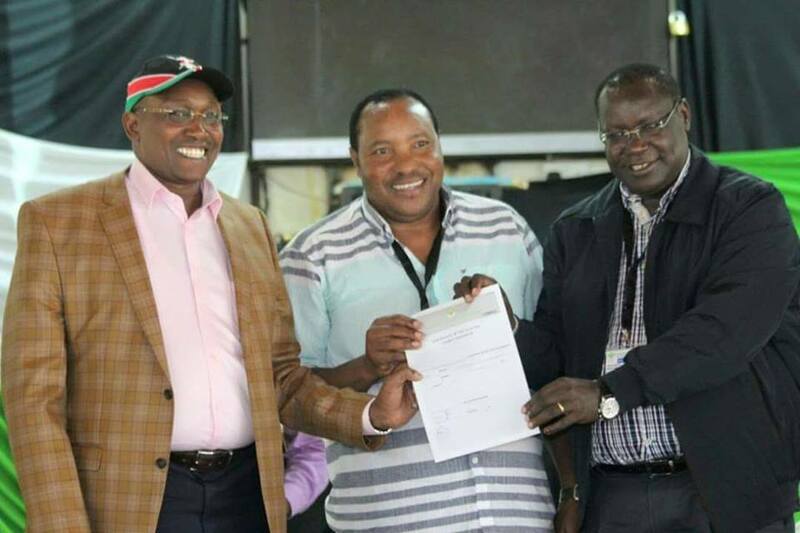 Kiambu Governor-Elect Ferdinand Waititu Baba Yao (Centre) showing off his election certificate after he won the Kiambu gubernatorial seat. With him is Rev. Bishop David Kariuki Ngari (Gakuyo) and Kiambu Deputy Governor-Elect Dr. James Nyoro (Right). The newly elected 47 governors will be sworn into office beginning tomorrow (Thursday) until next week. According to a proposal by the Devolution Cabinet Secretary Mwangi Kiunjuri, Machakos Governor Alfred Mutua and Ali Roba of Mandera will be the first to be sworn-in on Thursday. They will be followed on Friday by Onesmus Njuki, Martin Wambora, Mwangi Wa Iria, Joseph ole Lenku, Jackson Mandago and Paul Chepkwony. Kiambu Governor-Elect Ferdinand Waititu (Baba Yao) will be sworn in on Saturday in Ndumberi Stadium as his Nairobi counterpart Mike Mbovi Sonko will be sworn in on Monday the 21st at Uhuru Park. Kiunjuri said each county would determine its budget for the ceremony adding that the national government has made the necessary arrangements to ensure a smooth transition of power under the devolved system of Government. “Every governor will decide on the expenditure. If they want to be sworn into their offices with no ceremony, it is up to them,” said Kiunjuri as he detailed the schedule for the ceremonies for each of the 47 counties.